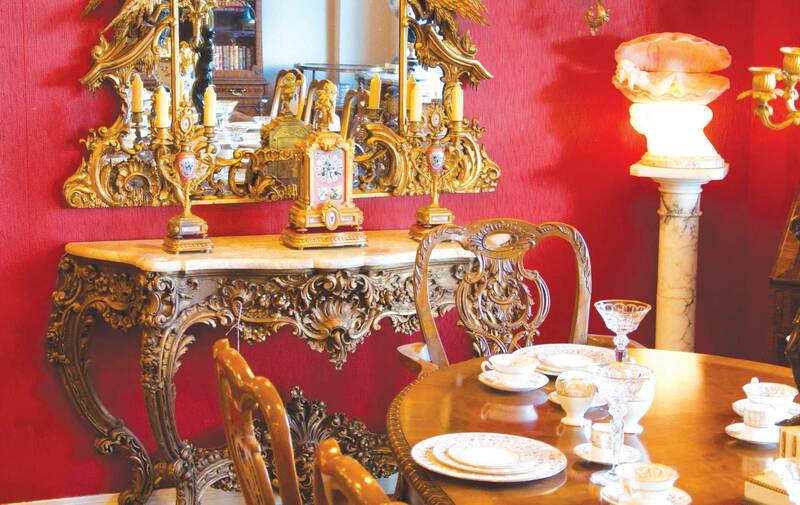 With generations behind the firm of Clements Antiques, the Clements family has mastered the art of antiquing. And Sandra Clements, in a setting that looks like the living room of a dream home, feels lucky to call Clements Antiques of Florida her own. The Clements Antiques story is a generational tale that goes back more than seven decades. Clements Antiques was started in Chattanooga, Tennessee, in 1938 by Doris and Charles Wallace Clements. In 1989, their daughter Sandra opened Clements Antiques of Florida on the beautiful coast of Miramar Beach; the store specializes in both antiques and interiors. Because her parents set up a vast network of suppliers throughout the years, Sandra is now working with second- and third-generation bankers and trust officers from all over America. But Sandra’s job isn’t just work—it’s tradition. With an incredible inventory located in a 28,000-square-foot showroom, Clements is a playground for antique lovers. In addition to furniture, works of art, mirrors, handmade rugs, screens, and original oil paintings are on display. Clements has a wide array of silver and bronze statuary, clocks, lamps, chandeliers, and even unusual accessories. Along with seventeenth- to twentieth-century wares, Clements also offers a large variety of the finest reproductions, including Althorp, Theodore Alexander, Maitland-Smith, Sherrill, Tomlinson/Erwin-Lambeth. Visiting the Clements showroom is like stepping into a museum or even stepping back in time. But more importantly, it’s like stepping into a home. Tradition and generations. These are words that are not only practically synonymous with the Clements family, but they are also descriptors inseparable from the business that has a phenomenal history of quality merchandise and excellent customer service. Honesty and integrity are of utmost importance to the Clements family. Clements has even expanded their interior design operation to supply clients’ needs for upholstered furniture, bedding, and linens. They now also have tableware from Versace, Baccarat, and Waterford, as well as antique china, crystal, and sterling flatware. Along with filling spaces with exquisite items, Clements is capable of doing a client’s home or office from top to bottom. This is a service that few firms provide—another clear indication that the Clements family is dedicated to servicing their clients.